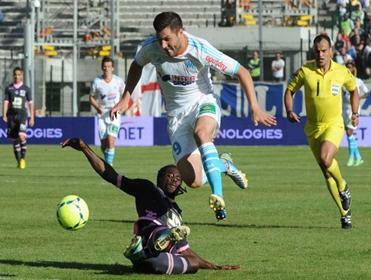 St Etienne are odds-on for their French Ligue One clash with Marseille tonight and while they need a win to keep their European hopes alive, Marseille are in fine form and are value for at least a point. "Away from Stade Vélodrome, Élie Baup’s men have won two of their last three and not conceded a goal in any of their last four." St Etienne are sixth with just two games to go but only one point separates them, Lille and Nice in the battle for fourth and a Europa League place. They were in a much more commanding position but just two wins from their last nine has scuppered their chances. In all fairness to The Greens, they haven't really been losing - last week's defeat to Lorient being the only one during that run - but they've simply dropped too many points to challenge at the top. Christophe Galtier's side have been quite strong at home - 18 points from a possible 24 - however they've drawn two of their last four and failed to register a goal last time against Bordeaux. It is also worth noting that St-Etienne haven't beaten Marseille in any of their last dozen meetings. Marseille will finish in second place no matter what their results in their final two games so it's perhaps wise to be cautious as they may play fringe players or lack motivation. I can't imagine they'll want to end their campaign on a low though and given that they're on a run of 10 unbeaten, it's doubtful that they'll give that up easily. Away from Stade Vélodrome, Élie Baup's men have won two of their last three and not conceded a goal in any of their last four. Their only recent defeat on the road came at champions, PSG, so that can easily be excused. St Etienne are odds-on because of perceived motivation and not form. That can be a dangerous rule to go by and at around the [1.91] mark, I have to make them my lay of the day.